Amigurumi Citrus Collection is an original crochet pattern by June Gilbank. 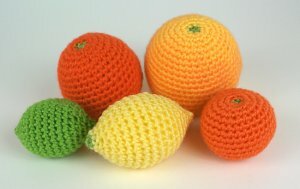 Make your own amigurumi fruit bowl with an entire collection of citrus fruits: life-sized and realistically shaped orange, lemon, grapefruit, lime and clementine patterns. Add a citrus leaf for extra realism, or make a cute fruit family by giving each fruit a face - the choice is yours. Send me a donation and receive the easy-to-print PDF version of the pattern as a thank you! The PDF also includes a bonus: a citrus leaf pattern, in both written and stitch diagram versions, with full instructions on how to add a crocheted leaf to any of your citrus fruits. Date Added: 09/15/2016 by Monica B. Date Added: 04/09/2015 by Julia R.
A great, easy, realistic pattern! Uses very little yarn and the results are awesome. Date Added: 09/09/2013 by Shekita H.
Date Added: 07/04/2013 by Alicia B.